The Catholic Church in the Central African Republic pleaded for firmer action by United Nations-backed peacekeepers after an attack on a Bangui church left the parish priest and at least 14 worshipers dead. The attack on Our Lady of Fatima Church on May 28 took place as worshipers prayed the rosary for the thousands of displaced people who had been sheltering in the parish compound. Father Paul-Emile Nzale, 76, was among those who died. An exact count of casualties was unavailable because some people were abducted by the attackers, officials said. "The international forces already here, and the reinforcements now expected, have been mandated by U.N. resolutions to disarm unconventional militias, using all necessary force," said Msgr. Cyriaque Gbate Doumalo, secretary-general of the Catholic bishops' conference. "But they've shown a lack of concern and we don't understand the game they're playing," he told Catholic News Service on May 30. "African troops were deployed near this parish, and yet they allowed this horrific act to take place. If they're not protecting the civilian population, what's the sense of their presence?" Witnesses said a group of men rode into the compound on motorbikes and threw grenades while opening fire on the church. Msgr. Doumalo said he found the parish "totally deserted," with its church and adjoining presbytery bullet-riddled and burned. Most of the internally displaced people have moved to a monastery run by Capuchin and Carmelite priests, he said. After the attack, barricades were erected in a "spontaneous demonstration" by local people—paralyzing much of the mostly Christian city—but Msgr. Doumalo said Ascension Day Masses had gone on as scheduled May 29 in parishes. "The government has blamed unnamed politicians for this attack, but it's clear from witnesses it was carried out by Muslims," Msgr. Doumalo said. "We've repeatedly warned the higher authorities that mercenaries from Chad and Sudan are hiding out in this district. Although we won't be terrorized into abandoning our religious practices, there's fear and tension among Catholics now, as well as anger and consternation, visible on every face," he explained. Local media reported that a Muslim mosque had been ransacked in Bangui's Lakouanga district after the church attack. In a May 29 statement, the Central African Republic's acting prime minister, Andre Nzapayeke, attributed the attack to a "well-planned plot" by "politicians close to power" hoping to oust the transitional government under interim President Catherine Samba Panza. Bangui Archbishop Dieudonne Nzapalainga told the Vatican's Fides news agency on May 30 tension was running high in Bangui and that demonstrators calling for the government's resignation were dispersed by army units. The archbishop said the attackers did not speak French or the local language, Sango, and had shouted "open the door" in English when they arrived. Msgr. Doumalo told CNS that many Central Africans were "exasperated" at continuing violence by Islamist Seleka rebels, who had captured Bangui in March 2013 but were driven back in January after the deployment of 2,000 French and 5,000 African peacekeepers. He added that despite the presence of mercenaries in and around the capital, the church would continue to promote peace and coexistence. "When we ask the peacekeepers why they're not protecting us, they say the government hasn't given them a mandate, and when we ask the government, they say the peacekeepers aren't their responsibility. This game of pingpong has been playing for some time," Msgr. Doumalo said. He said he believed the conflict in the Central African Republic was not a religious one, but that church leaders counted on local Muslims to disown groups who "spoke in the language of weapons." 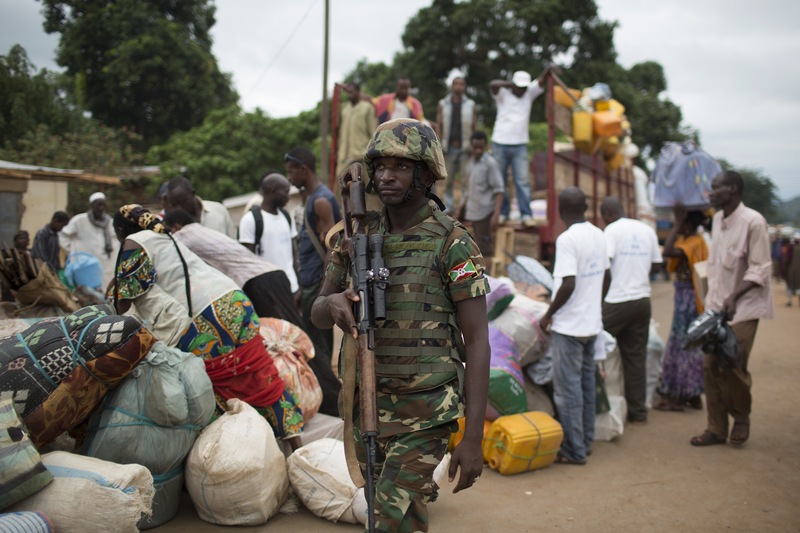 "Since Seleka arrived, they've played the religious card, trying to set people against their brothers. But if this was a religious fight you'd see Christians rising up, led from the front by their pastors," he said. "The problem is, first and foremost, political, and Christian and Muslim religious leaders will continue working together to restore peace despite such deplorable attacks." Father Nzale is the second Catholic priest confirmed killed in the conflict. Father Christ Forman Wilibona was shot Apr. 18 in the Bossangoa Diocese.